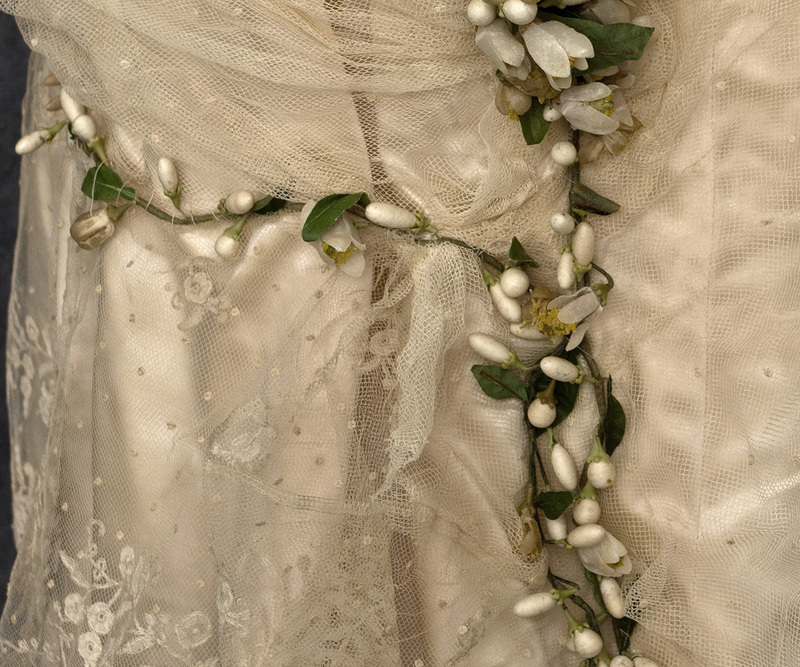 Because fine wedding gowns were typically recycled, it is very difficult to find an historically accurate one from this period. With an incredibly long cathedral train and costly handmade Brussels lace trim, this beauty is a rare find. 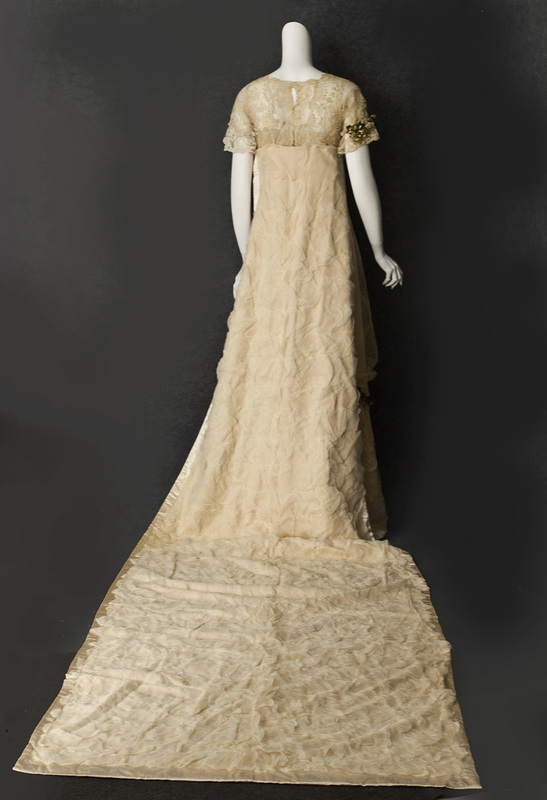 The gown, from a New England estate, was obviously very expensive when new. 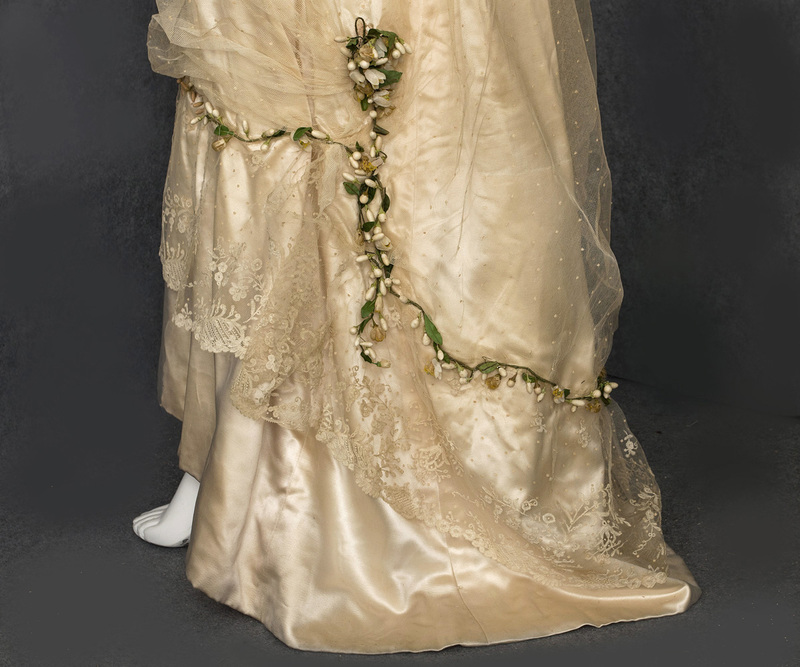 The cream colored satin gown is covered with layers of matching dotted swiss tulle and handmade Brussels lace. 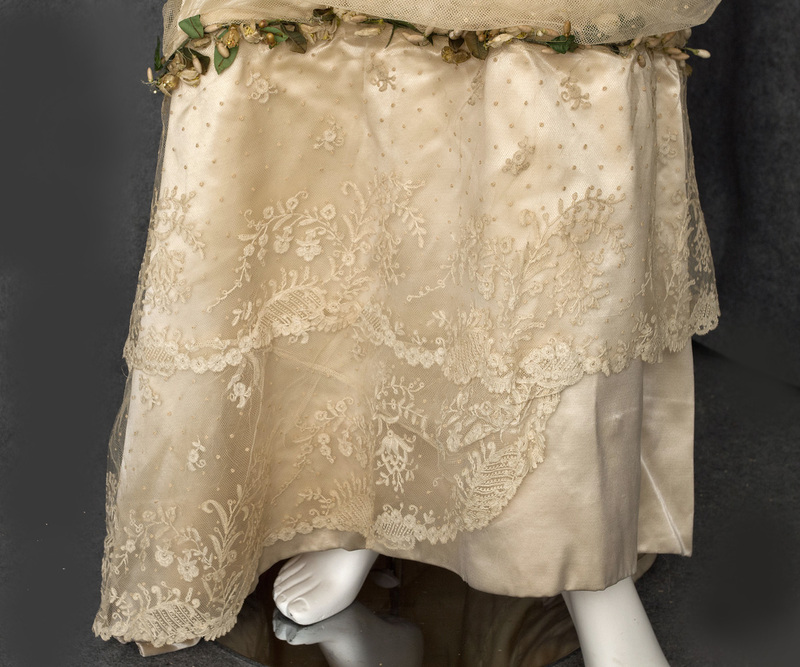 The poufed draped tulle on the skirt is anchored with a charming garland of waxed orange blossoms. 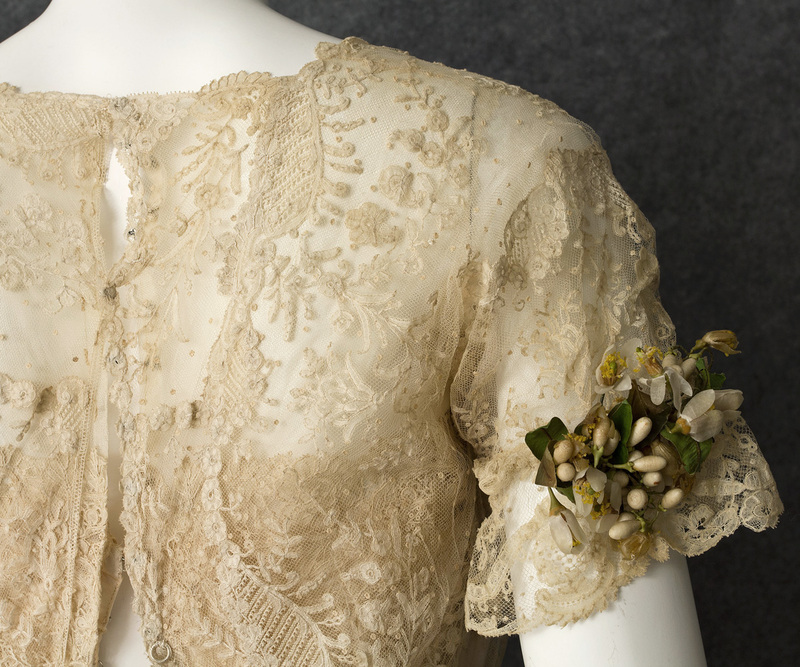 Additional orange blossoms embellish one sleeve. 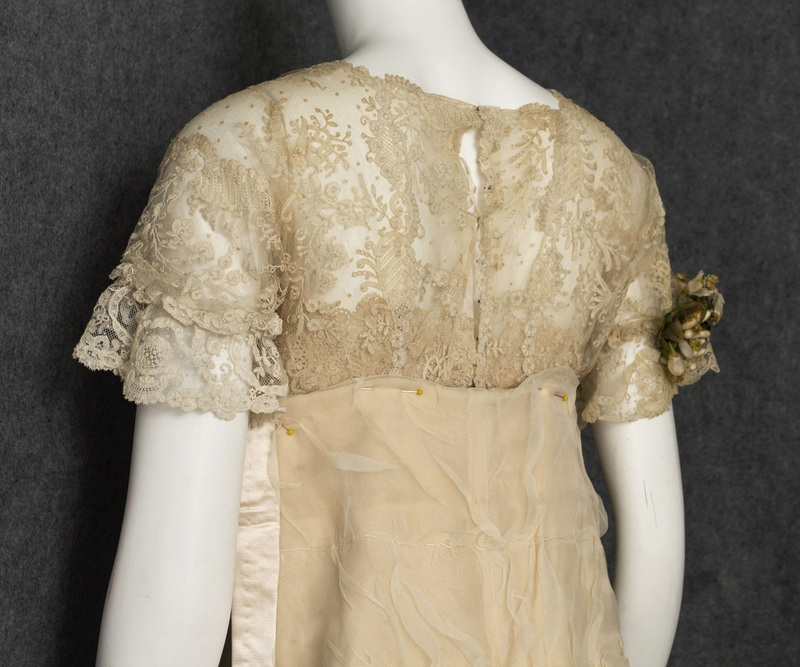 The boned under bodice has the original satin sachet at the center-front. 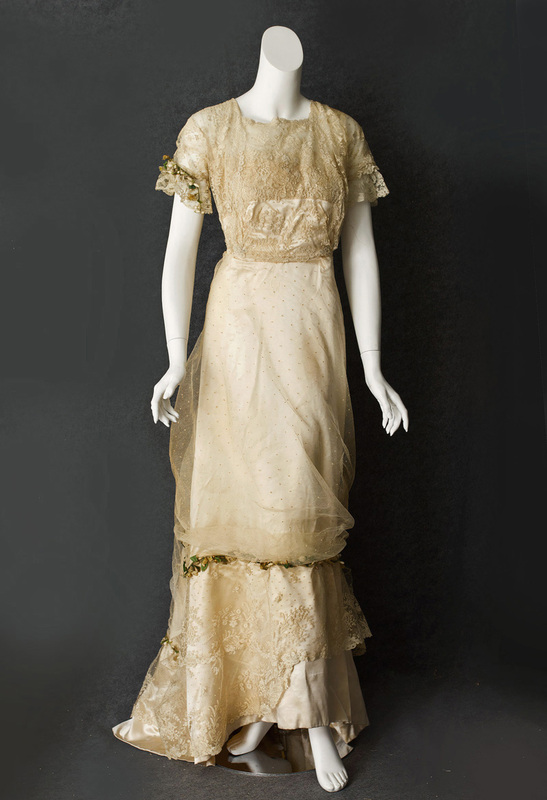 The label on the petersham reads "McNally/Newport/New York/Saratoga." The detachable long train fastens to the upper back with a hook. I pinned the train in place for photography so as not to put too much stress on the gown. The heavy satin train is weighted at the ends to ensure that it gracefully flows in your walk down the aisle. 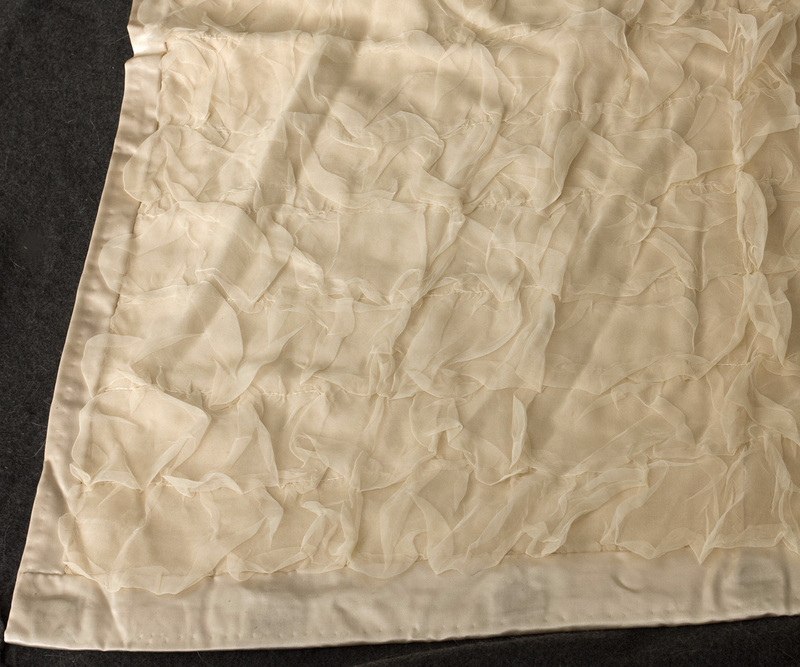 The outer surface is covered with matching ruched silk chiffon. The condition is very good. 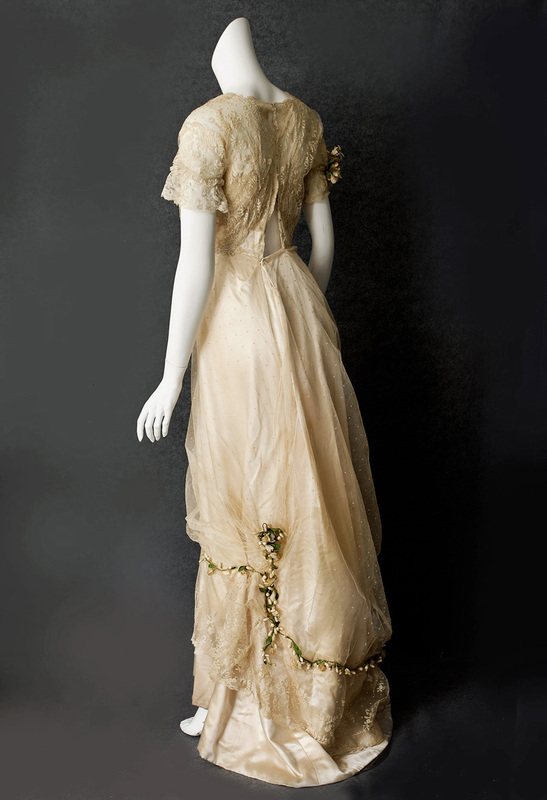 The dress displays beautifully as is, though there are a few minor problems. 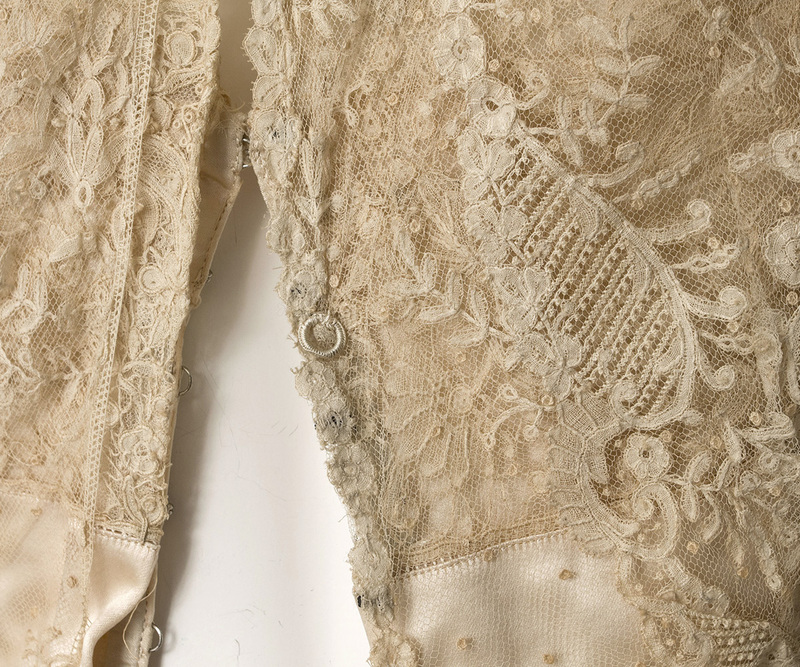 The chiffon upper section of the under bodice has some splits; and the color has darkened with age. 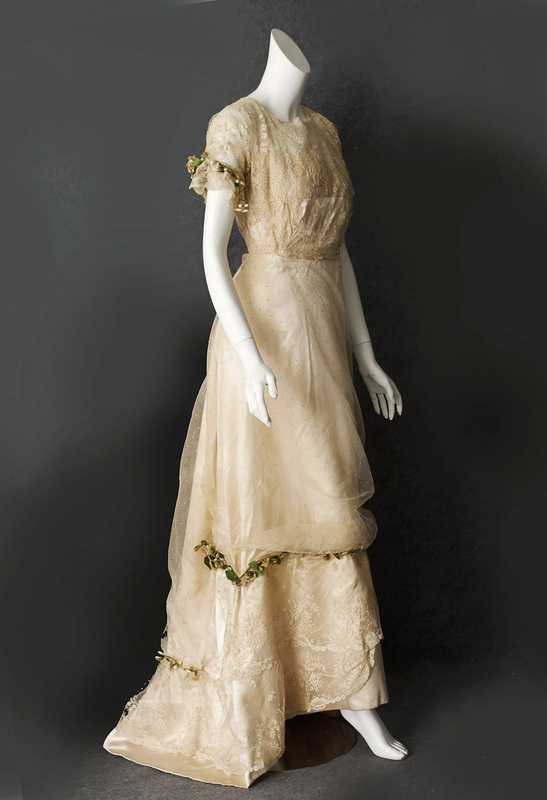 Here is a dress for the collector who wants unaltered historic accuracy although the dress is not currently wearable. 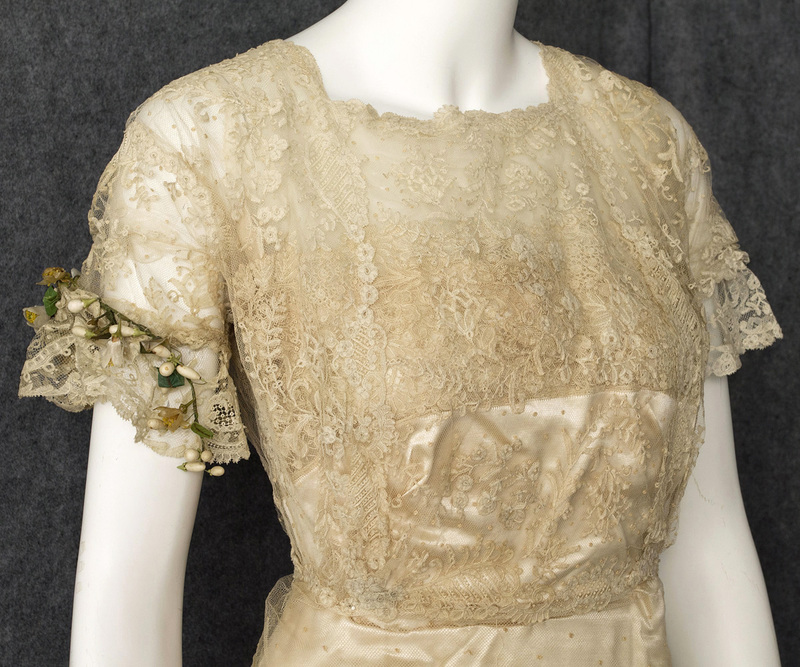 With proper cleaning and replacement of the underbodice chiffon, the price would be in the $2200 to $2300 range. It measures: 36" bust, 23" waist, 38" hip, and 58" from shoulder to front hem (longer in back).